But the egg-shaped, giant bronze heads by the longtime faculty member Robert Arneson are only part of the art that can be seen strolling the campus. 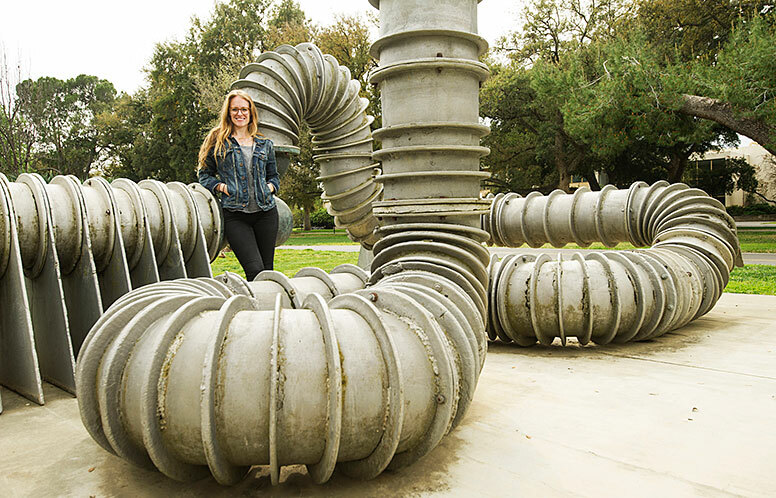 Art history graduate students Arielle Hardy, Justina Martino, Piper Milton and Brittany Royer have made these pieces even more accessible by creating the first guide to UC Davis’ public art. The guide gives insights into very visible artworks like the Eggheads and former art professor William Wiley’s What’s It All Mean gong at the Robert and Margrit Mondavi Center for the Performing Arts, along with nearly hidden pieces. You can download the guide for more details. At the bottom of this story, learn where the art is located on a campus map the art history group created. 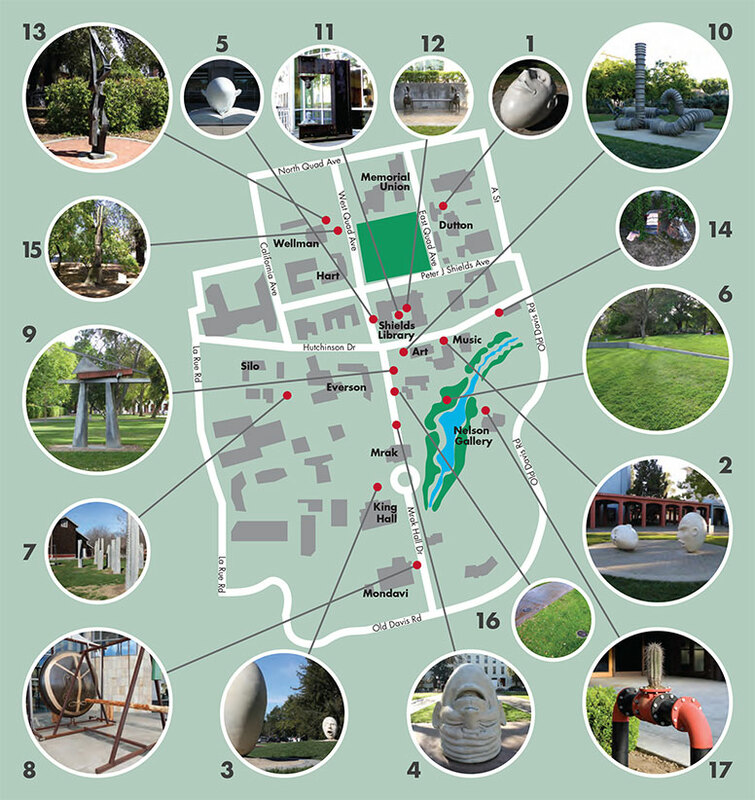 Some pieces — the Eggheads and Stone Poem by Steve Gillman — came to campus in the 1990s through the UC Davis Art in Public Places project. Stone Poem, a Stonehenge-like structure near the Silo, was shown at the university’s Nelson Gallery in early 1989. Later that year, while being stored in Oakland, the work was damaged during the Loma Prieta earthquake. The dozen huge stones were installed on campus a few years later with the damaged pieces made part of the work. Bum, Bum, You’ve Been Here Before was created by the late Professor Tio Giambruni in 1967 in the art department’s new foundry. The massive cast bronze and aluminum spent a decade in the Russell Boulevard median and another decade in storage before being installed in its current location on Hutchison Drive across the street from Shields Library. Among the hard-to-find works are the sculpted remains of a piece, This Redwood Tree, by Frederick Hirsch, Paul Taylor’s Cactus Suspension Assembly from 2011 that appears to be part of a water distribution system, and Joe Mannino’s ceramic Pink and Black that has been mostly hidden in the bushes outside the ceramics building for 35 years. Both Taylor and Mannino were students when they created their pieces, and Hardy was a proponent of making them part of the guide. “I wanted to make sure we included these student works that most people don’t notice,” Hardy says. Royer was in charge of the well-documented Eggheads that were some of Arneson’s final works before his death in 1992. Like most of Arneson’s art, they blend humor with social commentary. The very term “egghead” is an epitaph often aimed at university professors and others who are highly educated. Each of the Eggheads also has high arched eyebrows and often furrowed forehead, so they are “highbrow,” another term for an intellectual and connected with elitist art. The graduate student project is a collaboration between the art department, the Nelson Galler, and Jan Shrem and Maria Manetti Shrem Museum of Art.